The other day while I was updating my recipe index, I, for the nth time, told myself that I should really start making anything but desserts!!! Let's agree that we all indulge in sweets and desserts more often than we should! Atleast that's my case! I'm having to many candy crushes on desserts!! That is why, somebody inspired me to have a go at desserts only after making 3 dishes that have nothing to do with sugar!!! And as I was craving for some 'Beurre d'Ail' - (aka Garlic Butter) for a long long time, it was the perfect dish to start my sugar-free-course with! Leaving my modesty aside and being totally aware that Garlic Butter needs no introduction, this dish was excruciatingly delicious, honestly, the tangy bitter taste of lemon and garlic makes this a wow dish! For the extra factor, I served it on a bed of Lemon Parsley Rice! 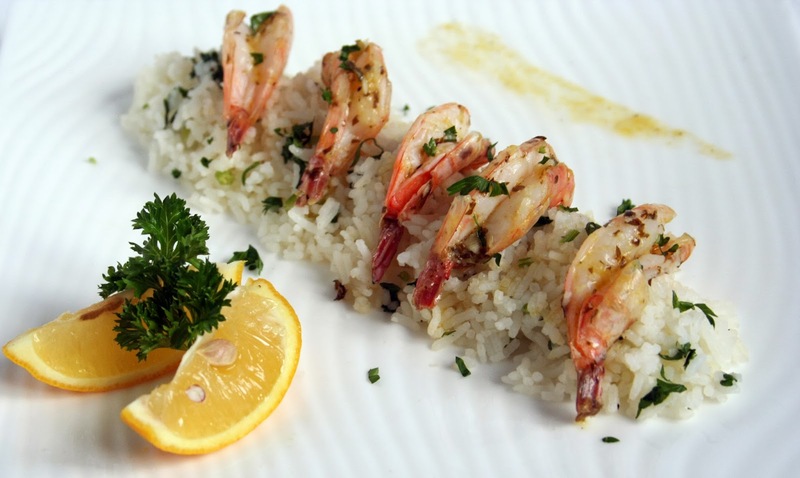 Garlic Parsley Butter Prawns on a bed of Lemon Parsley Rice! Wash rice until water is clear. Toss the rice and water in a rice cooker and let cook. When the rice is read, fluff it up using a fork. Throw in the lemon juice, the parsley, the butter and salt and pepper! Mix well and you're done! Toss in butter, garlic, juice of lemon and parley in a food processor/mortar. Process until just combined. Heat oil in a large frying pan on medium low heat. Pour in the butter mixture, and as soon as it starts to melt, throw in the prawns, seasonand let cook on each side for 45 seconds to 1 minutes or until pinkish! Prawns looks delicious and looks like served in a restaurant yum. tried it yesterday. marvellous. thank a lot.